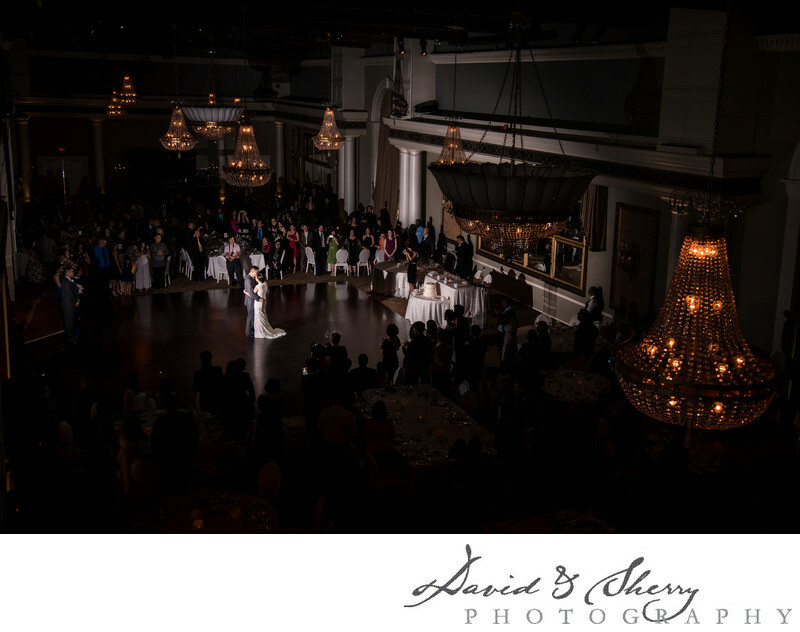 The Liberty Grand Entertainment Complex is one of the few venues in Toronto that can host 500+ wedding guests. This particular photo is of a large wedding with the bride and groom dancing on the dance floor to their favourite song with their hundreds of guests standing around in a circle watching along with them as they waltz around the hardwood. Earlier in the day they tied the knot and pledged their lives for each other til death do us part. Now they are amongst their stunning decor enjoying their first dance. I have run up the staircase in order to get an overview shot of them lit up by a flash held by Sherry and the overall look that it gives I believe is stunning. These are the kinds of crazy things we will do on a wedding day to get the shot. Shoot a few close photos of the dancing then sprint across the room weaving in and out of people to get up the stairs to get an overview photo only long enough to catch my breath and run back down to get the rest and the following parent dances. We love this job and can't wait to shoot your wedding.